Henry Sisson (BT '12), formerly of BCC Baseball. Though this week was not kind to most of the Big Train pitchers across the country, one starter and one reliever stood out from the rest. The first of those was Henry Sisson (BT ’12) of Davidson. Sisson is a recent addition to the roster by manager Sal Colangelo and is just a freshman at Davidson. Sisson is from Chevy Chase, MD and played baseball for BCC Baseball as well as for St. Alban’s School. 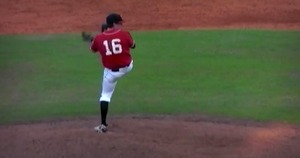 Sisson took the mound for Davidson on Friday for a match-up against The Citadel. Sisson went the distance and earned the win as he gave up only one earned run on six hits and two walks while striking out four. It was his third complete game of the season. As for the reliever, San Francisco’s Elliot Waterman (BT ’11) pitched a total of seven innings of relief last week. Waterman gave up only two earned runs on six hits and a walk while striking out five. The big week at the plate belonged to Cal Poly’s Tim Wise (BT ’11). Though his team split the week (2-2), Wise went 8/20, scored six times and drove in three runs for the Mustangs. That alone would have been a great contribution, but Wise made four of those eight hits go for extra bases (HR, 3 2B) and stole another base to add on to that. Other notable hitting performances: Adam Barry (BT ’11 / Cal State Northridge) - 6/14, 3R, 5RBI, HR, 2B… Landon Appling (BT ’11 / Houston) - 5/19, BB, 3R, 6RBI, HR, 2B, SB… Mason Morioka (BT ’09-’11 / San Francisco) - 5/14, BB, 3R, 2RBI, 2B… Colin Kish (BT ’12 / Florida Southern) - 6/12, HBP, 4R, RBI, 2B… Brenden Kalfus (BT ’11 / St. Mary’s (CA)) - 4/11, BB, R, 2RBI, SB… Michael Bass (BT ’11-’12 / UNC-Wilmington) - 3/8, BB, HBP, R, 4RBI… Brennan Middleton (BT ’11-’12 / Tulane) - 3/10, BB, HBP, 2R, 2B.